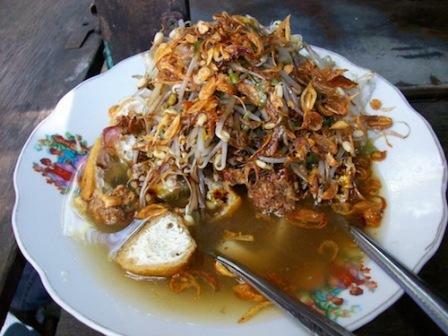 “Lontong balap” is originating from Surabaya, East Java. “Lontong balap” consists of sliced rice cake. “Lontong” is a kind of food which is made from ordinary rice wrapped in banana leaves or can be wrapped in plastic. It is a typical food of Indonesia and to cook it is need also a fairly long time. These foods can block the stomach when you're hungry because as well as the rice because “lontong” is also made of rice; it's just a different way of processing. It is usually combined with sprouts, tofu, lento, and can be added with the sauce or soy sauce and other ingredients. To enjoy these foods you do not need all the way into the Surabaya city, because here you will find a way of making “lontong balap” which is tasty and delicious. Of course you can try at home. Below is the recipe of how to make “lontong balap”. You need to boil the beef that has been cut until tender then take broth (remove and drain). After that, stir the seasoning until fragrant which is blended and then pour the beef broth. Then put the pieces of meat and then add sugar, salt and flavorings. You need to wait it until boiling and all the flavors mingle. All the ingredients of lento is mashed up except the onion leaves. After that, put lento seasoning into cassava grater and then add onion leaves, stir until well blended. Then make it into elongated round shape and then fry until lightly browned (remove and drain). You can cut the lento based on your interest. Stack “lontong” that has been cut on a plate and then add tofu, toge and lento. Pour broth of beef in it. Then, you can serve “lontong balap” with a sprinkling of fried onions and crackers. That’s our article about “Lontong Balap” Recipe.